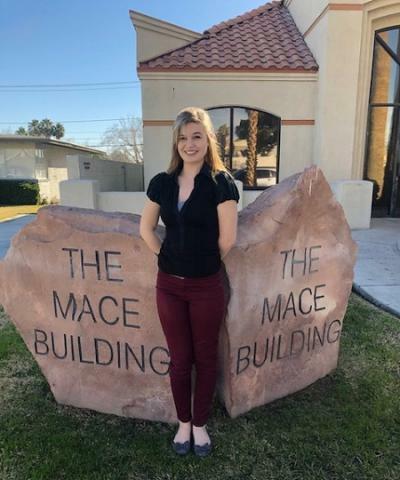 Mace Yampolsky & Associates, a criminal law firm located in Las Vegas, Nevada, is excited to have its new employee on board with the company, Kaitlin Stella. Kaitlin was born in Las Vegas but traveled around the world as a part of her military family. While being a part of a military family Kaitlin has gotten the chance to visit a wide variety of other countries. While living in Germany and going to school there she has gotten the chance to go and visit the Netherlands, Paris, Egypt (Hurghadah), Berlin, Munich, Luxemburg, Garmish, Austria, Belgium, Oman, and Dubai. Kaitlin graduated from Norman North High School, home of OU, and traveled to many other states while attending grade school. Kaitlin also attended Santa Fe University of Art and Design for photography. Kaitlin’s duties while working at Mace Yampolsky & Associates are as a Paralegal and an Intake Specialist. As a paralegal, Kaitlin will be expected to write letters, Motion for the Court, perform legal research, prepare the attorney and the client for depositions, summarize depositions, assist the attorney’s in trial, communicate with the clients, prepare exhibits and document production, and assemble them for court hearings. As an intake specialist, Kaitlin is the first voice that potential client’s hear and she will obtain necessary information and set appointments with the attorneys. Kaitlin is currently enrolled in college at Northwest Career College, where she is working to receive her Associates in Applied Sciences Degree in Paralegal Studies. Learning about the various aspects of the law she learning to draft various legal documents. Thanks to Kaitlin’s new job she is becoming knowledgeable in Record Sealing, Criminal Law, Personal Injury, and Federal Law. Kaitlin’s passion for the law allows her to continue her education further and constantly eager to learn new things. Kaitlin’s personality also shows while communicating with the clients in person and over the phone. She is also a member of the LVVPA and attends meetings and seminars to help continue her education. Kaitlin has future plans of continuing her education further after her time at Northwest Career College.